The Undergraduate Laws Programme hosted its annual Induction Day for new students on Saturday 6th October. Almost 50 Laws students attended a series of lectures and presentations at Senate House, and took part in useful practical activities. 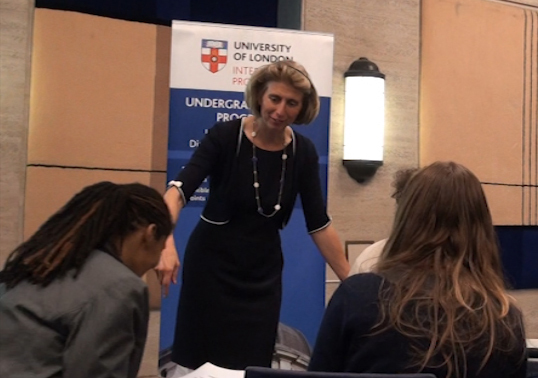 Professor Jenny Hamilton, Director of the Undergraduate Laws Programme, kick-started the day by introducing students to the International Programmes before Patricia McKellar, Senior Lecturer Learning and Teaching, highlighted general approaches to study, critical thinking and active learning. Students worked in small groups and had the opportunity to network; a rarity for many studying via distance learning. Students were also taken on a guided tour of the Online Library and the Laws VLE, completing tasks and gaining valuable practical experience of both. Dr Adam Gearey, lecturer in law at Birkbeck, gave an introductory lecture on Common Law Reasoning and Institutions which focussed on legal research requirements and associated compulsory activities, as well as study techniques, specific to the subject. And if that wasn’t enough, the day concluded with a panel of past and current LLB students who took to the floor to share their experiences of the programme. Answering insightful questions from the audience, the panel members were able to offer valuable advice on approaches to study, exam preparation and techniques, as well as tips to stay ahead of the game. They were also able to provide useful information about the Undergraduate Laws Programme from the student’s perspective and the benefits of attending the Laws Weekend Study Sessions. Adam Gearey’s lecture will be available on the VLE shortly. I participated in the induction day and I found It very useful and motivated and challenged to undertake my studies. I am working now in Dr. Congo and in effect studying on my own. I was able to network during the induction day. I will sure make use of my network and study hard for the exams in May 2013. I should be grateful if I am considered for the e- reader as mentioned by Patricia McKeller. Snr lecturer in learning and teaching. Where have they posted ADAM GEAREY’S lectures on V.L.E? I am unable to located can some one helps me out to located. The video from the Induction day is now available in the Common Law Reasoning course. Please let me know if you need a link.